What do you do, when your toddler outsmarts you by spitting out the almond in the choco-almond, after licking up all the chocolate ? I made burfi. Almond is ground to a paste, this way he cannot spit it out and get the protein he needs. Mamma outwitted her baby. So, here is a simple and healthy (when taken in moderation !) dessert for you to enjoy. Many of you might know how to make it. This is just a reminder for you and for those who haven't tried yet, believe me you'll love this. 1.Blanch and skin the almonds.Grease a tray with ghee. 2.Grind it in your blender or mixer-grinder, adding milk, until it becomes a paste.It's up to you whether it should be a nice butter-like paste or a bit coarse paste. But do not make it too coarse. 3.Heat ghee in a wide pan. 4.Mix the paste with the sugar and cardamom and add to the ghee. 5.Continuously stir the mixture until it starts leaving the sides and becomes thick. 6.Transfer it to the greased tray and level the top with the bottom of a spoon or a glass.Garnish with Almond slivers and allow to cool for 4-5 minutes. 7.Cut into the desired shape while it's still warm. 8.Allow to cool the burfi completely and store in an airtight container. 9.This stays good for a week in the room temperature and longer in the fridge. I have already written this in my Almond- Chocolate chip biscotti post here. 1.If you prefer to soak the almonds in advance and peel off the skin, then do it at least 5-6 hrs in advance in hot water. 2.Adding cardamom is optional, my family likes it without cardamom or saffron. Kids are too smart these days.My son does the same with food. Burfi looks awesome! badam burfi looks awesome, Namitha! very good way to get your kids to eat almonds. 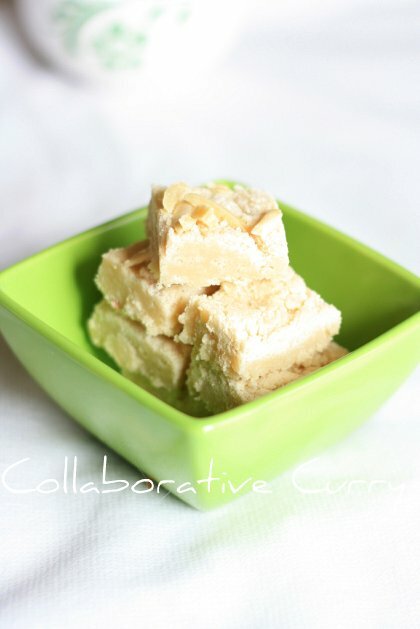 I recently made Coconut Burfi, Love ur Badam Burfi !! Looks tasty and beautiful click !! Dear Namitha..Now That I call a Smart Mamma !!!. Ur almond Burfi looks just divine..as you must know by now that I have a sweet tooth..In fact I was looking for something sweet for my next post...and this did cross my mind and I see it here now...I guess Sweet minds think alike ..lol. Superb Clicks..
Almond burfi kollam, Ingne vennum ammayayil. my sonny bpoy has started spitting out things when he does not like the taste. thats a great idea. will make it for him. bookmarked. Lovely burfis- the color is amazing! Almond candy sounds scrumptious, yum! Almond candies look so tempting! I've never had this before - it looks really tasty. This looks right up my alley! And beautiful pictures as usual. Thanks for sharing! Both Mom and Son are smart.. you are one step ahead to make nutritious food delicious for him..
Awesom almond burfi. Hope ur son liked it. Burfi looks so delicious. Thanks for dropping comments on my blog and following me. Barfi looks delicious and mouth watering. Yum, I love almonds. This looks delightful! I have some almond paste in my refrigerator now just waiting to be used in a Dutch dessert my mom always makes. super aayitundu, egg rolls um kalakki.. This something we could all make really easily and I love sweet almond pastes. nice picture and perfect badam! Your burfis look yum and I wish I could bite into some of these! you are a clever mom! good one! I have not tried these yet...planning to try soon after seeing your burfis. 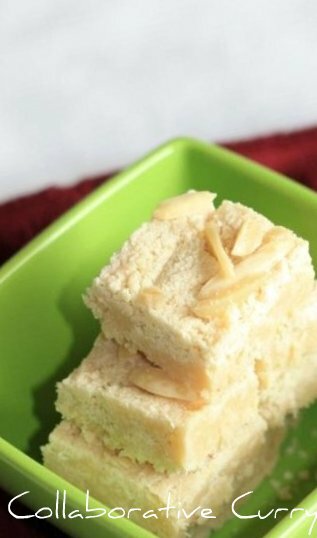 Almond burfi looks delicious and i wish to take one piece from your plate,, very rich one. Thanks for sharing dear,, take care n keep smiling. I love getting this from my Indian grocer, now I can try making it! If it meant my mom would make me something delicious like this, I would eat all of teh chocolate off of the almonds. Seriously. Amazing. This looks like it would be my perfect dessert! Seriously yummy recipe. Very lovely click. LOoks so perfect and lovely click. yum yum barfi...it sure tastes superb. My first time here. And OMG! your blog is a stunner. Love the pics n will be a glad follower. Waiting to find more time to go thru most of ur posts. Cheers! great-lloking burfi...I normally add saffron...it does taste divine! Burfi looks awesome! I can do with one of these right now.